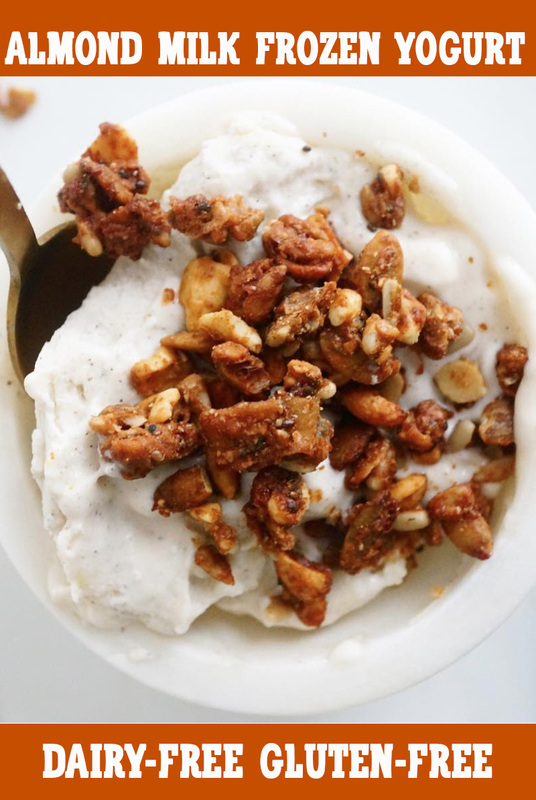 Dairy-free almond milk frozen yogurt topped with the best grain-free granola that you don’t have to make! It’s even vegan, gluten-free and Paleo-friendly! I posted this recipe to my Instagram over the weekend after lugging out my stainless steel electronic ice cream maker! It was in hibernation since early fall & we are in the 70s from here on out in Florida now! I had a container of Kite Hill Almond Milk Yogurt (plain, no sugar added!) in my fridge as well as an open can of coconut cream that needed to be used up! 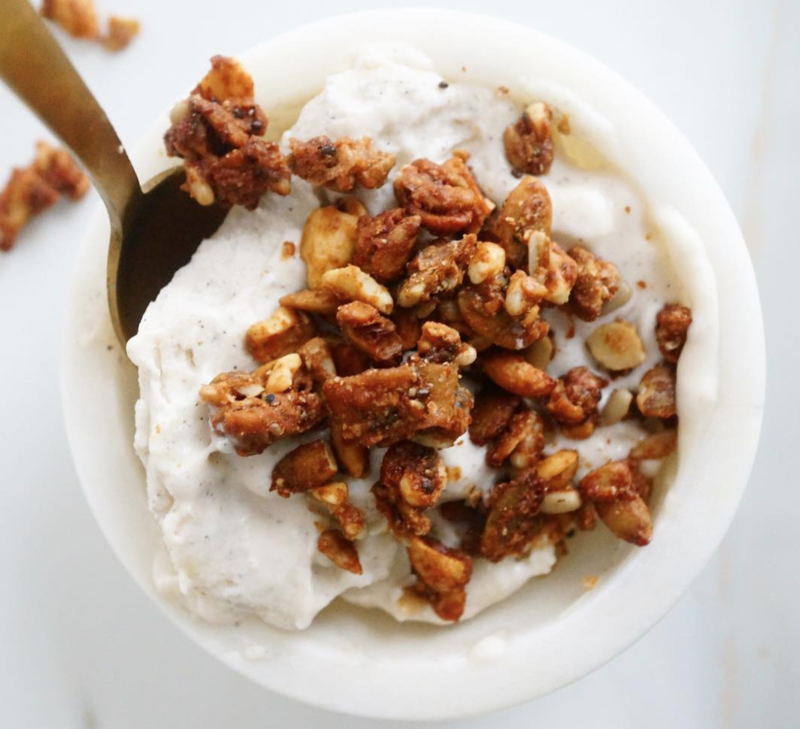 Thankfully, I also had some Purely Elizabeth Grain-Free Banana Nut Granola in my pantry because I couldn’t think of a better topping for this dairy-free frozen yogurt! This dairy-free frozen yogurt is tart, minimally sweetened and topped with crunchy, flavorful grain-free granola! It even uses sweet potato to make it extra creamy! The reason why you see me using white sweet potato in my frozen treat recipes is because almond milk and coconut milk have a much higher water content than cream or whole milk usually used in ice cream! All that fat helps it emulsify and prevent ice crystal formation which causes hardness. The sweet potato helps bind up some of those ice crystals so you get smoother, creamier ice cream without dairy or eggs! You can flavor your dairy-free frozen yogurt however you’d like! You can blend in strawberries (or top it with cooked strawberries – yum!) or replace the sweet potato with avocado and a handful of spinach for a green smoothie type of frozen yogurt! Get creative with your add-ins & toppings! I like when you use my recipes as base for your own kitchen experimentations because it helps YOU learn how combine flavors and textures too! Looking for more healthy dairy-free frozen treats? You have to try my Macadamia Cinnamon Cookie Ice Cream & Apple Pie Ice Cream! Blend all ingredients until smooth in your blender. 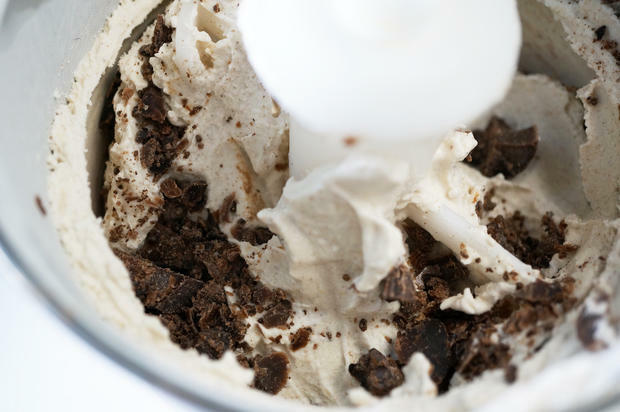 Pour into your ice cream maker & churn according to manufacturer's directions. Remove before it gets too hard to scoop. Top with Purely Elizabeth Grain-Free Granola & serve immediately! What brand of tamarind paste do you use in the spare ribs recipe that is in the Instant Pot cookbook? I tried to find something on your site about spare ribs using the menu button and was completely frustrated that no matter what I entered , nothing could be found. The old method (previous site) was so much easier! While I am enjoying both your books, I wonder what I’m doing wrong to not be able to access any specific information through this site.